The Gophers opened the second half on a 17-3 run and never looked back Saturday night. MINNEAPOLIS — One day before his team hosted Texas A&M-Corpus Christi, Minnesota head coach Richard Pitino harped on the importance of the Gophers tightening up their defense before the Big Ten begins. Better late than never to figure it out. Minnesota held the visiting Islanders to just 44 points — the fewest the Gophers have allowed all season — in a 65-44 victory to close out the nonconference season with an 11-2 record. With Michigan on the horizon in a few days, the Gophers’ defensive effort was perhaps the best it’s been all season in the final game before Big Ten play. "Certainly a very good defensive performance," Pitino said following Saturday’s win. "This was a bit of a trap game, looking ahead to the Big Ten. I thought our guys did not do that, so that was a testament to them." Scoring hasn’t been a problem so far for the Gophers in Pitino’s first season at the helm. The 31-year-old head coach preaches an uptempo style of play that has led to easy buckets in transition for Minnesota. Defense, however, has been a different story as the Gophers had allowed 66.8 points per game, tied for fourth-worst among all Big Ten teams. Prior to Saturday’s win, the Gophers’ season low for points allowed was 57 against Wofford. 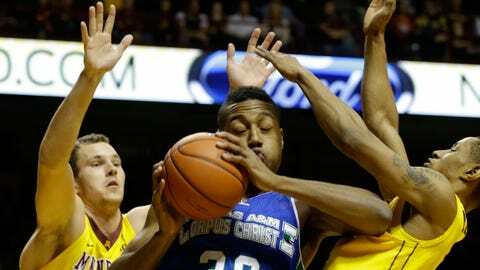 Minnesota limited Corpus Christi to just 21 points in the first half on 9-of-24 shooting. The Gophers players set a goal at halftime to limit the Islanders to under 40 points for the game. While that goal ultimately wasn’t reached, it was a sign that Minnesota’s players have taken Pitino’s defensive pleas to heart. "We were like, ‘Let’s hold them under 40. Let’s take pride in our defense,’" said junior Andre Hollins. "That’s what the teams that are cutting down the nets, they take pride in their defense." By the end of Saturday’s 21-point win, the Gophers held the Islanders to just 35.4 percent from the floor and a meager 6.7 percent (1-of-15) from 3-point range. Some of that credit is due to Minnesota’s increased pressure on defense, while some of the blame also falls on Corpus Christi’s poor shooting. Yet Minnesota also forced 18 turnovers, including nine steals, and had six blocks. A team like Corpus Christi — which has now lost eight in a row — may not have been the toughest test for Minnesota as it now heads into the Big Ten season, but Saturday’s defensive effort can certainly be used as a springboard going forward. "That’s his main focus," senior Austin Hollins said of Pitino’s emphasis on defense. "I think we have a good offensive team, but in order for us to compete (in the Big Ten), we’re going to have to be equally as good defensively. That’s something that we’ve been working on, and I think tonight we took a big step forward defensively, holding them to 44 points." "Recently, he’s been bringing (the stats) out more and more," said point guard DeAndre Mathieu. "We’re starting to get accustomed to what they are and what they stand for. He says they show where you’ll be down the road in the season and how you’ll play." It remains to be seen just how much the Gophers’ nonconference schedule has or has not prepared them for the rigors of the Big Ten. Pitino has yet to coach a game in this conference, and several of his key players have also never faced another Big Ten team. While Pitino hasn’t broken down any Big Ten game film — that starts now — he did show his team some recent film of a Miami Heat game. Pitino was down in Miami over the holiday break and admired the way the Heat played team defense. His players seemed to be taken notes during that film session. "I thought they really learned from that; they really responded from that," Pitino said. "It seemed like they wanted to take the next step defensively. . . . In order to do what we want to do in the Big Ten, we have to defend, and I think the guys acknowledged that."